Based in the Netherlands, Rob has decades of involvement in organisational development for both for-profit and non-profit organisations. He is widely known for his work in promoting authentic leadership, interpersonal competence, emotional intelligence, inclusion and culture change. Rob is an enthusiastic speaker at conferences throughout Europe and North America and a sought-after facilitator of strategic planning processes. He regularly offers two intensive open programs: Interpersonal Competence and Leadership in Turbulent Times (in Bali). Rob is affiliated with The Kaleel Jamison Consulting Group of Troy, New York, is a graduate of the Dutch Institute for Social Sciences and a Certified Management Consultant. 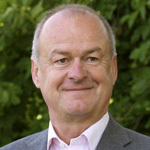 He has authored four books: No nonsense with heart (No-nonsense met een hart | Scriptum Books, 1996, 1998), Managing from the heart (Ondernemen met gevoel | Scriptum Books, 1998), Honesty: the best policy (Cyan Scriptum, 2004), Creating tomorrow’s organization today (Vandaag doen wat morgen nodig | van Duuren, 2014).